This beaming soup draws its aromatic flavours from a luscious marriage of spices that grace it with a taste equivalent to a hug from the inside. 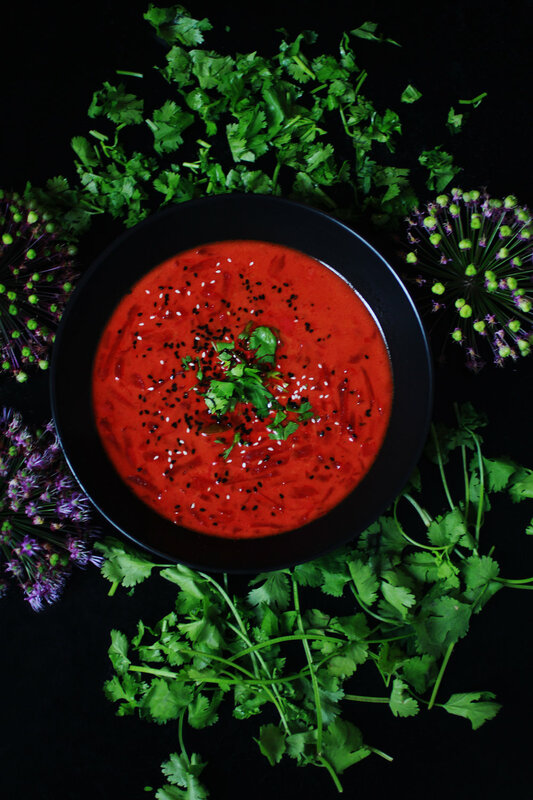 Thanks to the all year round presence of beetroot, this delightful soup is one that we enjoy slurping whenever we crave delicious comfort of the spicier kind. Heat coconut oil in a pan. Add mustard seeds and wait until they begin to pop (1-2 minutes). Add the onion and sweat until translucent (7-10 minutes). Stir regularly. Add the spices, mix well and cook for 2 minutes. Add the garlic and continue cooking for another minute. Pour the vegetable stock and the coconut milk and cook for 40 minutes. Add more water in case the consistency should become too thick for your taste. Season to your liking and serve topped with a drizzle of roasted sesame oil, white and black sesame seeds and coriander leaves.